The long-awaited reconstruction began in Gaza City on Thursday, July 23, 2015. Photo: AP Photo/ Khalil Hamra. Awad Nawasra, 52, was delighted when he got a call from the Ministry of Labor in Gaza to come and sign a contract in order to start rebuilding his completely demolished home in Gaza’s el-Maqazi camp. . .
____Nawasra’s home was targeted by the Israeli military planes three times during the conflict last summer. Four of his family members were killed in the first raid. ____The current plan aims to build only one floor for every completely damaged house, regardless of the size of the previous house. 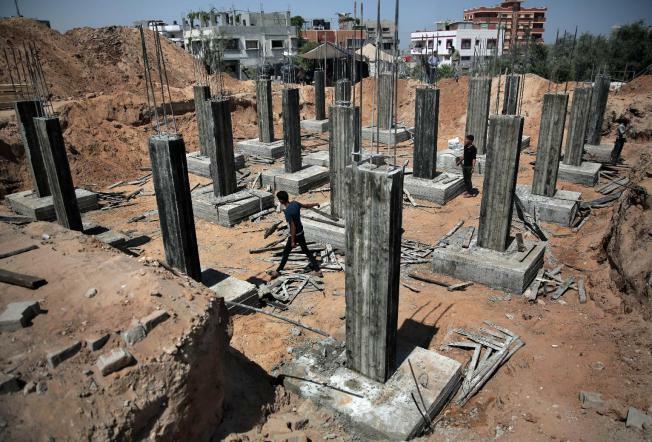 ____Reconstruction is now being seen in nearly all of Gaza’s districts as part of the funds that were pledged at the Cairo Conference to reconstruct Gaza have started to be delivered to Gaza. Extremist Israeli settlers set fire to Palestinian farms and pasture lands in the south of the West Bank city of Nablus, local Palestinian sources told the Anadolu Agency yesterday. 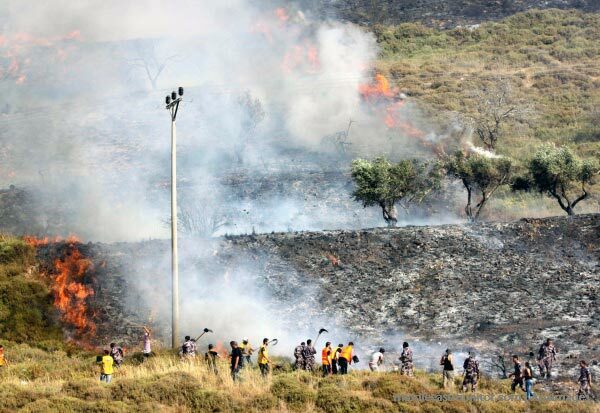 ____Member of the council of Burin Village Waleed Obaid said that a number of settlers snuck into the eastern areas of the village and set fire to over than 10,000 square metres of pasture lands. ____The settlers, who came from a nearby illegal settlement, withdrew safely under the protection of the Israeli occupation’s troops, he explained. SALFIT―Israeli forces on Monday demolished a home under construction in the village of Deir Ballut in western Salfit and delivered demolition orders in western Nablus, locals said. ____Dawood Abdullah, a local activist, told Ma’an that large numbers of Israeli troops escorted two bulldozers into Deir Ballut in the early hours of Monday and immediately started to tear down an incomplete house belonging to Adnan Abdullah. ____The activist said that the home, which was in an area known locally as Khallat Qaswal, was one of 60 houses in the village located in land classified as Area C.
RAMALLAH — An earthquake that measured 5.2 magnitude hit Palestine on June 27. Since the earthquake, whose epicenter was in the Red Sea region, the Earth Sciences and Seismic Engineering Center at An-Najah National University in Nablus has been tracking seismic activity south of Aqaba. ____This earthquake was one of hundreds that had been tracked by earthquake detectors in the region since the beginning of the year, which prompted experts to renew their calls for increasing preparations to face a possible earthquake. Studies indicate that Palestine, which is situated in a seismically active region, would be greatly affected by a strong earthquake. ____According to Dabbeek, several faults exist in Palestine, and their time to crack or cause an earthquake has come. This story was written for the Gaza-based We Are Not Numbers project. ____As I prepare to leave the UK to return to Gaza, my mind is a jumble of thoughts. When I originally filed my visa application so that I could study in the UK, my mind was a mess. . .
____It was two years ago that I was accepted into a clinical training program at Oxford University. Until then, I never believed that some dreams do come true. . . I was among just 50 students from all over the world to be selected for this training at Oxford. It is only a two-month course, but let’s face it, it was a once-in-a-lifetime opportunity. ____Now, as I am about to finish my training course at Oxford, my visa will expire as of August 21. I will not be allowed to stay in the UK anymore. However, I also will not be allowed to enter Egyptian lands until the crossing is open again. . . . So, my only real choice is to do nothing but wait. Fingers crossed again. pitched there to make a myth of the sky. and a smell from the sea surround us. The singer has multiplied in us. The imam has multiplied in us. Talk has multiplied in us. fragment our bodies with victory! their suns and their names dispelled. a reason for every absence and return. There are countries buried in the dust. to speak of their lore to the silence. From: Nasrallah, Ibrahim. RAIN INSIDE: SELECTED POEMS. Trans. Omnia Amin and Rick London. Willimantic, CT: Curbstone Press, 2009. ―Available from Amazon. 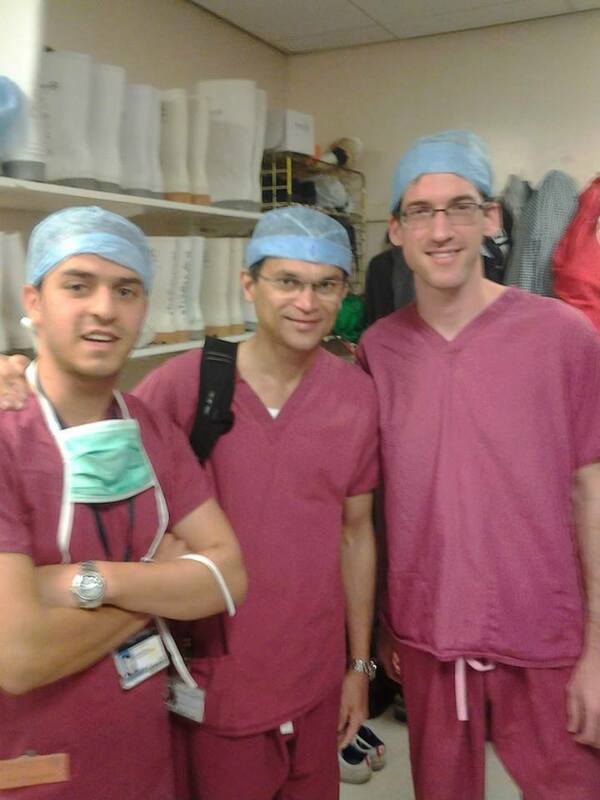 Said al-Yacoubi (far left), with two members of the Oxford transplant team.